The first two issues of a new project for H-Latam's book review section are now up! As a part of the attempt to catch up on a backlog of books and generate more participation in the network's book review section, I've been organizing collections of reviews on themes, regions, and methodologies currently of interest to Latin American historians. These include both reviews of new publications as well as conference summaries on related subjects. The first covered a number of new works on Brazilian environmental history and a conference on the same topic, and the second brought together recent books on the Cold War in Latin America and a related conference called "Traveling Technocrats." You can find the collections at the links below! If you have any ideas for future collections, or have a conference summary you would like to contribute, please be in touch. I'm happy to start the new year with the publication of a special issue of the Business History Review that grew out of a conference I helped organize while the Newcomen fellow at the Harvard Business School. That conference, "The Political Economy of Food: Grown Locally and Consumed Globally" (Cambridge, MA, June 2015), generated a number of great conversations across time periods and geographies, and the special issue continues that trend. From pieces on standardizing fruit production and food dyes in the United States, to chocolate marketing in Great Britain and my own piece on agricultural development policies in Mexico, the issue gives an overview of current research on the business of food. My own article, "Developing the Mexican Countryside: The Department of Fomento's Social Project of Modernization" traces the nineteenth and early twentieth century history of the formation, expansion, and eventual contraction of a bureaucracy dedicated to development. While scholars have looked at a number of Fomento's component parts, I have yet to find a comprehensive synthesis of this important ministry's larger project. That there was a larger project is one of the key arguments of the article, as is the argument that social as well as economic aims were generally taken into account. I hope fellow historians find the piece useful, not just scholars of Mexico, but those looking at broader histories of rural development and modernization during this period. The special issue can be found on the Business History Review's homepage, here, and my own piece can be accessed here. For International Coffee Day, I'm posting a short piece on California's historical connections to coffee that I wrote over the summer with the thought of sending it out into the world. As life got busy and I haven't yet sent it round, I'll put it here for now. On an afternoon in late July, the radio host rattled off a list of crops damaged by a wildfire in Santa Barbara County. The California Department of Agriculture was reaching out to the owners of avocado, olive, and lemon orchards damaged by the Sherpa fire. One crop stood out amongst this almost stereotypically Californian farm box: coffee. Coffee is a crop of the tropics, not our Mediterranean climes. Originating in what is now Ethiopia, coffee orchards have come to circle the globe, but only between the bounds of Capricorn and Cancer. First the East Indies – Java, Mocha – then the West – Saint-Domingue, Jamaica – followed by Brazil and Central America and Colombia, then back to Africa, Indonesia, now Vietnam. Across five centuries, coffee saplings have sailed the oceans and been lugged up mountains, carefully packed in woolen batting, closely guarded by agronomists and entrepreneurs bent on further extending the valuable crop’s reach. Now, thanks to the climate change that is subjecting more and more of that traditional reach to flooding and temperature fluctuations, places like Santa Barbara, equally subject to drought and wildfire, have become the new frontier. California has a long history with coffee, but always as importer, not producer. With the Gold Rush came San Francisco’s dominance of Pacific shipping routes, and the rise of the railroads connected the country's interior to tropical goods coming north from Latin America, east from Asia. New Orleans had a hold on sugar, bananas, and cheap coffee from Brazil and the Caribbean, but San Francisco was a quicker approach for high quality beans coming from Hawaii, Java, and western Latin America. A beautiful array of trademarks in the California State Archives attest to the multitude of importers and roasters spread across the state. Folgers had its start in San Francisco, and Hills Brothers, which perfected the vacuum sealing process that kept in roasted coffee’s flavor, was just down the street. By the late nineteenth century, Californians also followed the lure of the bean south to try their hands at the work of planting and harvesting. They took up the challenge set in land company advertisements to exploit Latin America’s vast and untapped riches, reversing the product’s usual steamship journey in the hopes of making good on promises of easy profits. Across the twentieth century, importers and roasters continued their work around the San Francisco Bay. While the Pacific Northwest lays claim to the advent of second and third wave coffee culture, Californians also had a hand to play in the popularization of higher quality, smaller batch beans. Companies like Peet’s Coffee and the San Francisco Bay Coffee Company helped usher in a new era of organic and fair trade importing, and the Californians behind Blue Bottle and Intelligensia have done much to get Americans focused on not only the origins, but also the careful roasting and brewing of their beans. Cultivating relationships with farmers across the tropics, California coffee companies have educated consumers’ taste buds and made us more aware of the environmental and social impacts of our morning cup. And now Californians are beginning to grow coffee of their own. The temperate foothills of California’s coastal range in many ways mimic the topography of Central America’s Sierra Madre and Colombia’s Paisa region. While its weather patterns differ – irrigation has to make up for smaller average rainfall and planters have to keep a wary eye for frost – the central coast of the state, it turns out, can support the growth of high quality beans. Working with agronomists at UC Davis and planters with generations of experience from Guatemala, farmers like Jay Ruskey of Good Land Organics have begun the process of further diversifying California’s agriculture. While their harvests are still small and their costs far exceed those of tropical counterparts, this newest generation of coffee entrepreneurs believes the work is vital. With climate change impacting traditional growers in myriad ways – from flooding and fires to the rapid spread of coffee rust and other pests – new methods have to be developed, new landscapes explored. Fringe farms like theirs, places where planters can play with new varietals and new techniques, are an important part of helping all those who grow coffee adapt to environmental change and all of us continue to enjoy our morning brew. I've joined the H-Net staff as a book review editor for the H-Latam network! I'm excited about this opportunity to reach out to scholars across many fields and engage with new and innovative scholarship. I'll be focusing my editorial work on books related to economic, environmental, and migration history as well as the history of Latin America in the world. In the hopes of promoting greater participation in network discussions, we’ll be bringing the network roundtables on noteworthy new books, “special issues” around particular topics of interest, and reviews of exhibits and digital resources. If you would like to sign up to act as a reviewer, please fill out this form and we'll be in touch soon! My article, "Insecure Labor, Insecure Debt: Building a Workforce for Coffee in the Soconusco, Chiapas" is now out in the May 2016 Hispanic American Historical Review. Between 1870 and 1920, the department of the Soconusco in Chiapas, Mexico, became the country's largest exporter of coffee to global markets. The expansion of this economy required the mobilization of an ever larger workforce in the service of international commerce. Yet, as this article argues, global demand could only remake social and economic relations within the parameters of entrenched local structures. In the Soconusco, the development and endurance of incentivized contracts as opposed to coercive debt peonage were the result of tapping into a dispersed and diversified labor pool. By looking at the history of finca San Juan las Chicharras, this article explores both the day-to-day functioning of coffee plantations and the ways in which workers, planters, and politicians alike grappled with the redirection of their output toward ever more lucrative export production. I just finished up a fantastic weekend at the second biannual Richard Robinson Business History Workshop, this year called "Business and Environment in History: Dealing in Nature and Ecology, Past and Futures." It was a great chance to meet scholars in the midst of projects at the intersection of business and environmental history and exchange thoughts on works in progress. 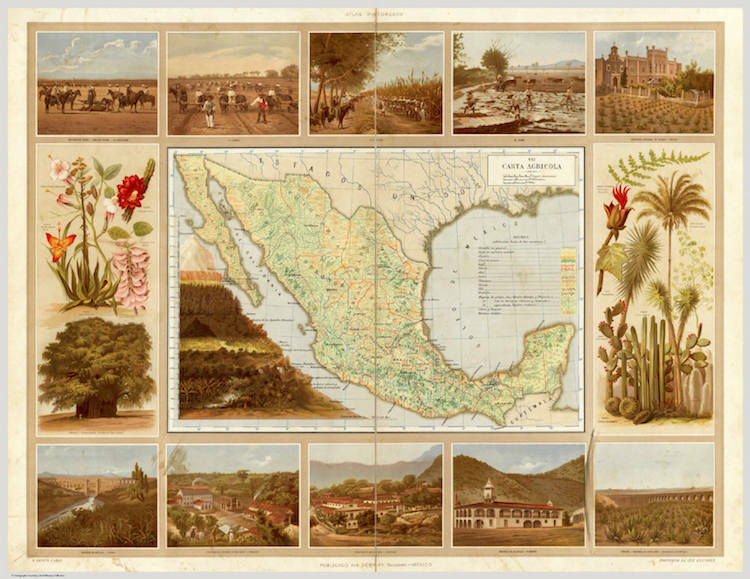 I presented on depictions of nature in official Mexican reports and maps from the Porfiriato, and got to talk about my favorite Antonio García Cubas map, the Carta Agrícola from the 1885 Picturesque and Historical Atlas of the United Mexican States and bureaucratic exhortations to make the most of Providence's gifts. The conference was refreshingly international in scope, with talks from Jennifer Eaglin on drought and Brazil's ethanol programs and Noah Haiduc-Dale on the endurance of subsistence fisheries in the Persian Gulf amongst others, plus thought-provoking pieces on risk abatement and community in Anaconda's Butte, MT mines from Brian Leech, landscape and oil pipelines from Sarah Stanford-McIntyre, and a slough of others on resource management and environmental regulation in the United States. Congratulations to the organizers for a wonderfully productive and well-run conference! The wonderful people at the Harvard Business School's Working Knowledge interviewed me and wrote up this great piece on my research while the Newcomen Fellow.